Leukocytosis refers to an increase in the total number of white blood cells (WBCs) due to any cause. From a practical standpoint, leukocytosis is traditionally classified according to the component of white cells that contribute to an increase in the total number of WBCs. Therefore, leukocytosis may be caused by an increase in (1) neutrophil count (ie, neutrophilia), (2) lymphocyte count (ie, lymphocytosis), (3) monocyte count (ie, monocytosis), (4) eosinophilic granulocyte count (ie, eosinophilia), (5) basophilic granulocyte count (ie, basophilia), or (6) immature cells (eg, blasts). A combination of any of the above may be involved. 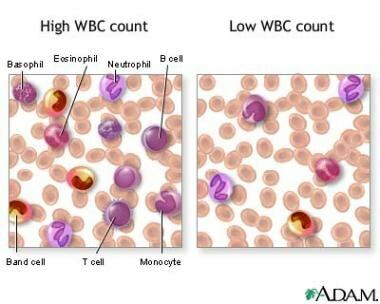 The image below is an illustration of high and low WBC counts. Neutrophilia also is divided into 4 categories based on the mechanism of neutrophilia: (1) increased production, (2) decreased egress from vascular space (demargination), (3) increased mobilization from the marrow storage pool, and (4) reduced margination into the tissue. Clinically, dividing leukocytosis on the basis of its causes is more convenient. By dividing it according to causes, leukocytosis can be immediately applied for diagnostic purposes. Leukocytosis can be caused by infection, inflammation, allergic reaction, malignancy, hereditary disorders, or other miscellaneous causes. Leukocytosis can be a reaction to various infectious, inflammatory, and, in certain instances, physiologic processes (eg, stress, exercise). This reaction is mediated by several molecules, which are released or upregulated in response to stimulatory events that include growth or survival factors (eg, granulocyte colony-stimulating factor, granulocyte-macrophage colony-stimulating factor, c-kit ligand), adhesion molecules (eg, CD11b/CD18), and various cytokines (eg, interleukin-1, interleukin-3, interleukin-6, interleukin-8, tumor necrosis factor). Hyperleukocytosis (WBC count >100 X 109/L, or >100 X 103/µL) occurs in leukemia and myeloproliferative disorders. Hyperleukocytosis often causes vascular occlusion, resulting in ischemia, hemorrhage, and edema of the involved organs. The problem is most commonly observed in acute myelogenous leukemia with high WBC counts. Individuals often clinically present with mental status changes, stroke, and renal or pulmonary insufficiency. If the neutrophil count exceeds 30,000/μL as a reaction to extrinsic factors, such as infection, it is sometimes called a leukemoid reaction. In a person with sickle cell disease, the baseline WBC count is elevated with a mean of 12-15 X 109/L (12-15 X 103/µL). This change mainly is due to a shift of granulocytes from the marginated pool to the circulating compartment. The segmented neutrophil count increases in both vaso-occlusive crisis and in bacterial infection in patients with sickle cell disease. Clinically significant morbidity and mortality are frequently observed in patients with leukemic hyperleukocytosis. Hyperleukocytosis may result in tumor lysis syndrome and disseminated intravascular coagulopathy. In addition to well-known complications (eg, acute respiratory failure, pulmonary hemorrhage, CNS infarction, hemorrhage), splenic infarction, myocardial ischemia, renal failure due to renal vessel leukostasis, and priapism have been reported. Always remember age-specific reference ranges for total WBC, neutrophil, and lymphocyte counts. The total WBC and neutrophil count in neonates younger than 1 week are physiologically higher than those of older children and adults. The proportion of lymphocytes and absolute lymphocyte count in children younger than 6 years are higher than those in adults. Failure to recognize age-specific lymphocytosis may lead to unnecessary investigations (see the table below for reference ranges of age-related leukocyte counts). Infants (usually aged < 3 mo) have small storage pools of neutrophils. In severe infections, their neutrophilic demands often exceed their supplies. Therefore, young infants may have neutropenia in response to serious infection. * Numbers of leukocytes are in X 109 \L or thousands per μ L; ranges are estimates of 95% confidence limits; and percentages refer to differential counts. † Neutrophils include band cells at all ages and a small number of metamyelocytes and myelocytes in the first few days of life. Cotran RS, Kumar V, Collins T. Robbins Pathologic Basis of Disease. 6th ed. Philadelphia, PA: WB Saunders; 1999. 644-96. Claver-Belver N, Cano-Corres R, Miro-Canis S, Berlanga-Escalera E. Pseudohyperkalemia due to severe leukocytosis: case presentation. Clin Chem Lab Med. 2016 Dec 1. 54 (12):e365-7. [Medline]. Mahmood E, Knio ZO, Mahmood F, et al. Preoperative asymptomatic leukocytosis and postoperative outcome in cardiac surgery patients. PLoS One. 2017. 12 (9):e0182118. [Medline]. [Full Text]. Lee GM, Harper MB. Risk of bacteremia for febrile young children in the post-Haemophilus influenzae type b era. Arch Pediatr Adolesc Med. 1998 Jul. 152(7):624-8. [Medline]. Brown L, Shaw T, Wittlake WA. Does leucocytosis identify bacterial infections in febrile neonates presenting to the emergency department?. Emerg Med J. 2005 Apr. 22(4):256-9. [Medline]. Hsiao AL, Chen L, Baker D. Incidence and predictors of serious bacterial infections among 57- to 180-day-old infants. Pediatrics. May 2006. 117:1695-1701. Hsiao R, Omar SA. Outcome of extremely low birth weight infants with leukemoid reaction. Pediatrics. 2005 Jul. 116(1):e43-51. [Medline]. Zanardo V, Vedovato S, Trevisanuto DD, Suppiej A, Cosmi E, Fais GF. Histological chorioamnionitis and neonatal leukemoid reaction in low-birth-weight infants. Hum Pathol. 2006 Jan. 37(1):87-91. [Medline]. Arav-Boger R, Baggett HC, Spevak PJ, Willoughby RE. Leukocytosis caused by prostaglandin E1 in neonates. J Pediatr. 2001 Feb. 138(2):263-5. [Medline]. Talosi G, Katona M, Turi S. Side-effects of long-term prostaglandin E(1) treatment in neonates. Pediatr Int. 2007 Jun. 49(3):335-40. [Medline]. Ballin A, Lehman D, Sirota P, Litvinjuk U, Meytes D. Increased number of peripheral blood CD34+ cells in lithium-treated patients. Br J Haematol. 1998 Jan. 100(1):219-21. [Medline]. Zhang S, Condac E, Qiu H, et al. Heparin-induced leukocytosis requires 6-O-sulfation and is caused by blockade of selectin- and CXCL12 protein-mediated leukocyte trafficking in mice. J Biol Chem. 2012 Feb 17. 287(8):5542-53. [Medline]. [Full Text]. Allam JP, Paus T, Reichel C, Bieber T, Novak N. DRESS syndrome associated with carbamazepine and phenytoin. Eur J Dermatol. 2004 Sep-Oct. 14(5):339-42. [Medline]. Gungor E, Alli N, Comoglu S, Comcuoglu C. Phenytoin hypersensitivity syndrome. Neurol Sci. 2001 Jun. 22(3):261-5. [Medline]. Lupton JR, Figueroa P, Tamjidi P, Berberian BJ, Sulica VI. An infectious mononucleosis-like syndrome induced by minocycline: a third pattern of adverse drug reaction. Cutis. 1999 Aug. 64(2):91-6. [Medline]. Liu F, Mahgoub N, Ferrando S. Leukocytosis associated with clozapine treatment: a case report. Psychosomatics. 2011 Sep-Oct. 52(5):488-91. [Medline]. Shpall RL, Jeffes EW, Hoffman HM. A case of familial cold autoinflammatory syndrome confirmed by the presence of a CIAS1 mutation. Br J Dermatol. 2004 May. 150(5):1029-31. [Medline]. Granger JM, Kontoyiannis DP. Etiology and outcome of extreme leukocytosis in 758 nonhematologic cancer patients: a retrospective, single-institution study. Cancer. 2009 Sep 1. 115(17):3919-23. [Medline]. Alizadeh P, Rahbarimanesh AA, Bahram MG, Salmasian H. Leukocyte adhesion deficiency type 1 presenting as leukemoid reaction. Indian J Pediatr. 2007 Dec. 74(12):1121-3. [Medline]. Rosa JS, Schwindt CD, Oliver SR, Leu SY, Flores RL, Galassetti PR. Exercise leukocyte profiles in healthy, type 1 diabetic, overweight, and asthmatic children. Pediatr Exerc Sci. 2009 Feb. 21(1):19-33. [Medline]. Aydogan M, Aydogan A, Kara B, Basim B, Erdogan S. Transient peripheral leukocytosis in children with afebrile seizures. J Child Neurol. 2007 Jan. 22(1):77-9. [Medline]. Alioglu B, Ozyurek E, Avci Z, Atalay B, Caner H, Ozbek N. Peripheral blood picture following mild head trauma in children. Pediatr Int. 2008 Jun. 50(3):281-3. [Medline]. Furlan JC, Krassioukov AV, Fehlings MG. Hematologicl abnormalities within the first week after acute isolated traumatic cervical spinal cord injury: a case-control cohort study. Spine. Nov/2006. 31:2674-83. [Medline]. Osawa I, Nagamachi S, Suzuki H et al. Leukocytosis and high hematocrit levels during abdominal attacks of hereditary angioedema. BMC Gastroenterology 2013, 13:123. August/2013. 13:123. Plo I, Zhang Y, Le Couédic JP, Nakatake M, Boulet JM, Itaya M. An activating mutation in the CSF3R gene induces a hereditary chronic neutrophilia. J Exp Med. 2009 Aug 3. 206(8):1701-7. [Medline]. [Full Text]. Snyder RL, Stringham DJ. Pegfilgrastim-induced hyperleukocytosis. Ann Pharmacother. 2007 Sep. 41(9):1524-30. [Medline]. Drago F, Cogorno L, Agnoletti AF, Parodi A. Role of peripheral eosinophilia in adverse cutaneous drug reactions. Eur Rev Med Pharmacol Sci. 2015 Jun. 19 (11):2008-9. [Medline]. Cherfane CE, Gessel L, Cirillo D, Zimmerman MB, Polyak S. Monocytosis and a Low Lymphocyte to Monocyte Ratio Are Effective Biomarkers of Ulcerative Colitis Disease Activity. Inflamm Bowel Dis. 2015 May 19. [Medline]. Nguyen R, Jeha S, Zhou Y, et al. The Role of Leukapheresis in the Current Management of Hyperleukocytosis in Newly Diagnosed Childhood Acute Lymphoblastic Leukemia. Pediatr Blood Cancer. 2016 May 17. [Medline]. Mamez AC, Raffoux E, Chevret S, et al. Pre-treatment with oral hydroxyurea prior to intensive chemotherapy improves early survival of patients with high hyperleukocytosis in acute myeloid leukemia. Leuk Lymphoma. 2016 Feb 5. 1-8. [Medline]. Marcus N, Smuel K, Almog M, et al. Successful Intravenous Immunoglobulin Treatment in Pediatric Severe DRESS Syndrome. J Allergy Clin Immunol Pract. 2017 Nov 30. [Medline]. Choi MH, Choe YH, Park Y, et al. The effect of therapeutic leukapheresis on early complications and outcomes in patients with acute leukemia and hyperleukocytosis: a propensity score-matched study. Transfusion. 2018 Jan. 58 (1):208-16. [Medline]. Tien FM, Hou HA, Tsai CH, et al. Hyperleukocytosis is associated with distinct genetic alterations and is an independent poor-risk factor in de novo acute myeloid leukemia patients. Eur J Haematol. 2018 Apr 6. [Medline].